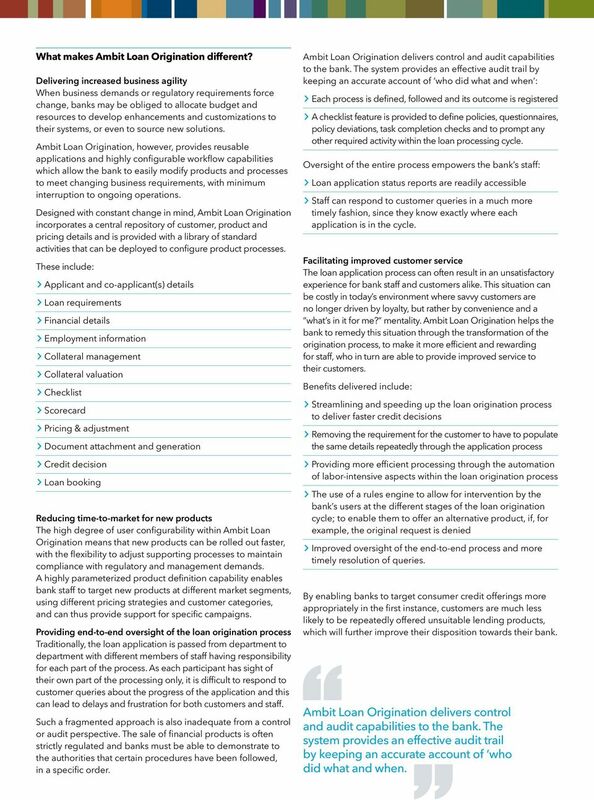 Download "AMBIT LOAN ORIGINATION A New Approach"
2 The benefits of the Ambit Loan Origination approach Automating the entire loan origination process while retaining flexibility The loan origination cycle in many banks is a time consuming, largely manual procedure involving a number of departments and redundant activities. These outdated processes not only slow down the loan outcome for customers, they also invite errors, can cause compliance issues and, because of the considerable resources needed to move existing loan applications through the system, they hinder the speed-to-market of new credit products. Ambit Loan Origination provides high levels of automation throughout the loan origination cycle to improve productivity and reduce costs. Based on user-defined, highly configurable business processes and a parameterized product definition capability, Ambit Loan Origination delivers the flexibility that allows the bank to adapt products and processes to meet changing business requirements. User-configurable checklists, process flows, scorecards, pricing, asset valuation, document automation and business rule definition all add to the bank s ability to turn around loan applications faster, with a higher degree of accuracy, better risk assessment, improved compliance and greater control over pricing. Delivering Benefit User-configurable checklists, process flows, scorecards, pricing, asset valuation, document automation and business rule definition all add to the bank s ability to turn around loan applications faster, with a higher degree of accuracy, better risk assessment, improved compliance and greater control over pricing. Credit Product Definition Parameters for the definition of new credit products and associated loan origination processes. New products can be rolled out more quickly, with the flexibility required to offer the range of products desired for the target market, enabling the bank to offer competitive products. Workflow Configuration The ability to design dynamic loan origination workflows which support the entire origination lifecycle. Support for business rule definition and rule-based routing within the workflow process. Facilitates seamless routing and automated task allocation between bank staff leading to timely credit decisions and greater STP within the loan booking process. Pricing Information, Definition & Adjustment Pricing engine to facilitate and automate the application of pricing strategies, interest rates, fees and commissions. Enables banks to tailor pricing against customer categories, ratings and other classifications. Loan Application Capture Management of integration with other applications involved in the application process (e.g. valuations and credit checks). Pre-population of existing customer and account information appropriate to the loan application minimizes data capture and costly manual duplications for staff and customers. This maximizes processing capacity without increasing human resources. Credit Scoring & Rating Loan Approval Document Generation & Attachment Loan Booking Automated scorecard included, with flexibility to adjust weightings of the various elements (e.g. salary, investment income, etc.) The ability to automatically approve or decline loan applications automatically, based on pre-defined conditions. Powerful tools allow banks to define templates for document generation. Banks may define the required incoming and outgoing documents for each loan product and soft copies of documents can be attached. The approved loan can be automatically created and disbursed in the back office system. Increased efficiency and greater business agility as scorings can be adjusted in response to changes in market conditions and scorecard performance. Manual decision-making effort is reduced and customers receive the loan outcome earlier. Automated decisions improve compliance, enforce bank credit policy and reduce manual intervention required. Helps banks to maintain consistency and ensure completeness of critical loan documentation. Improves efficiency in the production of loan documentation. Ensures that loan accounts are created as approved, reducing the opportunity for fraud. The automated loan booking improves efficiency and alleviates the requirement for manual re-keying of information. Ambit Loan Origination, provides reusable applications and highly configurable workflow capabilities which allow the bank to easily modify products and processes to meet changing business requirements, with minimum interruption to ongoing operations. 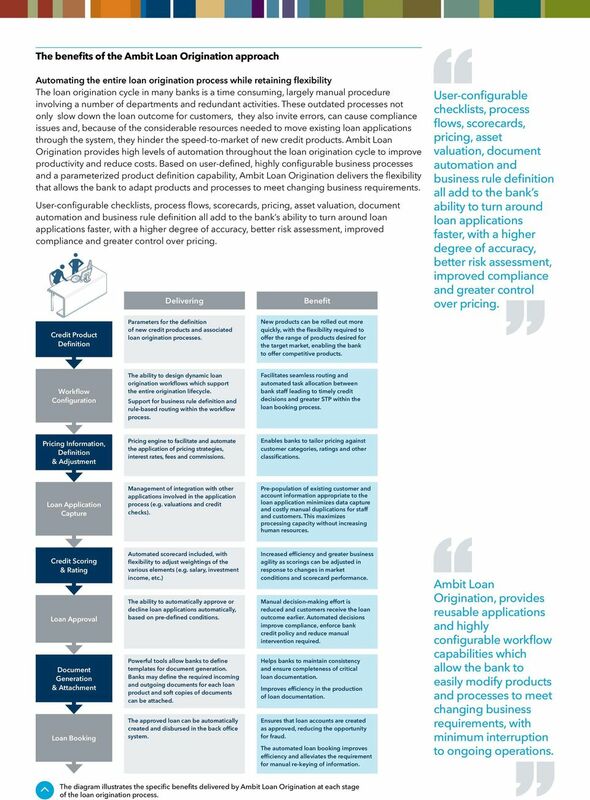 The diagram illustrates the specific benefits delivered by Ambit Loan Origination at each stage of the loan origination process. 3 What makes Ambit Loan Origination different? Delivering increased business agility When business demands or regulatory requirements force change, banks may be obliged to allocate budget and resources to develop enhancements and customizations to their systems, or even to source new solutions. 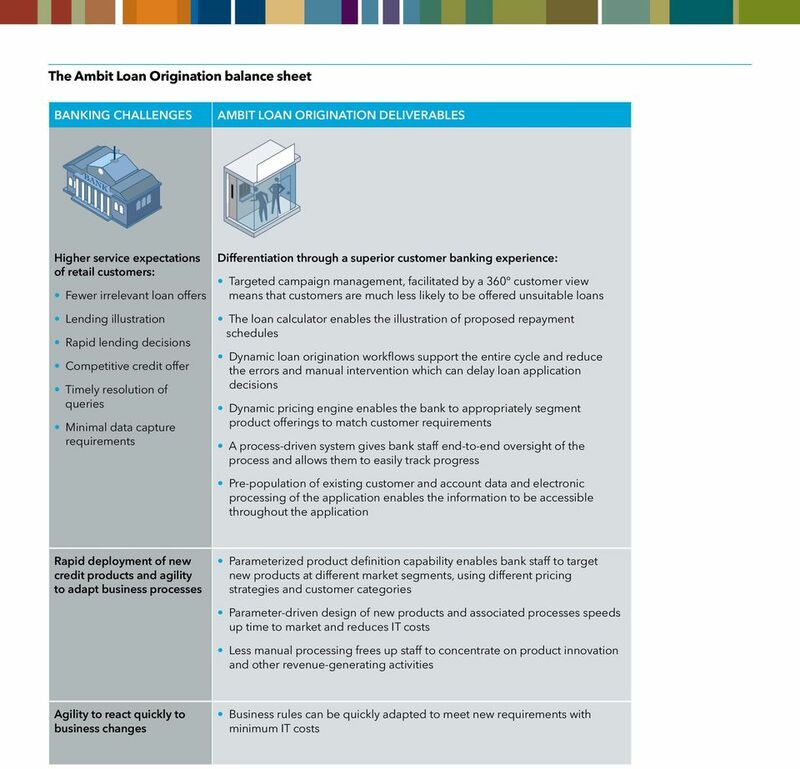 Ambit Loan Origination, however, provides reusable applications and highly configurable workflow capabilities which allow the bank to easily modify products and processes to meet changing business requirements, with minimum interruption to ongoing operations. 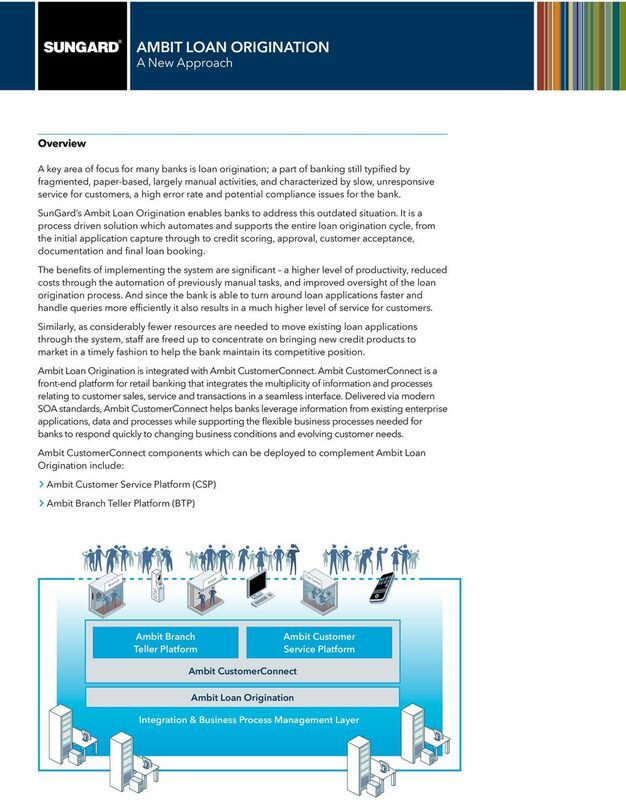 Designed with constant change in mind, Ambit Loan Origination incorporates a central repository of customer, product and pricing details and is provided with a library of standard activities that can be deployed to configure product processes. These include: Applicant and co-applicant(s) details Loan requirements Financial details Employment information Collateral management Collateral valuation Checklist Scorecard Pricing & adjustment Document attachment and generation Credit decision Loan booking Reducing time-to-market for new products The high degree of user configurability within Ambit Loan Origination means that new products can be rolled out faster, with the flexibility to adjust supporting processes to maintain compliance with regulatory and management demands. A highly parameterized product definition capability enables bank staff to target new products at different market segments, using different pricing strategies and customer categories, and can thus provide support for specific campaigns. Providing end-to-end oversight of the loan origination process Traditionally, the loan application is passed from department to department with different members of staff having responsibility for each part of the process. As each participant has sight of their own part of the processing only, it is difficult to respond to customer queries about the progress of the application and this can lead to delays and frustration for both customers and staff. Such a fragmented approach is also inadequate from a control or audit perspective. The sale of financial products is often strictly regulated and banks must be able to demonstrate to the authorities that certain procedures have been followed, in a specific order. Ambit Loan Origination delivers control and audit capabilities to the bank. The system provides an effective audit trail by keeping an accurate account of who did what and when : Each process is defined, followed and its outcome is registered A checklist feature is provided to define policies, questionnaires, policy deviations, task completion checks and to prompt any other required activity within the loan processing cycle. Oversight of the entire process empowers the bank s staff: Loan application status reports are readily accessible Staff can respond to customer queries in a much more timely fashion, since they know exactly where each application is in the cycle. Facilitating improved customer service The loan application process can often result in an unsatisfactory experience for bank staff and customers alike. This situation can be costly in today s environment where savvy customers are no longer driven by loyalty, but rather by convenience and a what s in it for me? mentality. Ambit Loan Origination helps the bank to remedy this situation through the transformation of the origination process, to make it more efficient and rewarding for staff, who in turn are able to provide improved service to their customers. 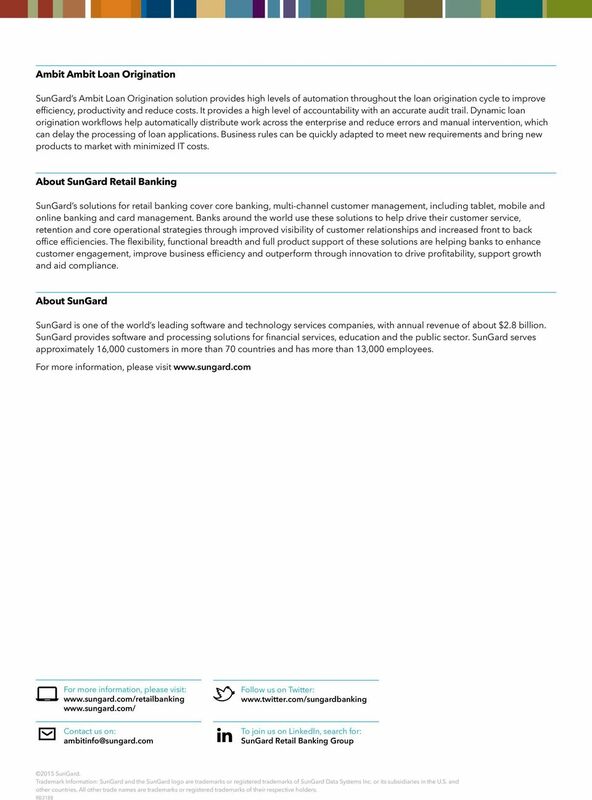 Benefits delivered include: Streamlining and speeding up the loan origination process to deliver faster credit decisions Removing the requirement for the customer to have to populate the same details repeatedly through the application process Providing more efficient processing through the automation of labor-intensive aspects within the loan origination process The use of a rules engine to allow for intervention by the bank s users at the different stages of the loan origination cycle; to enable them to offer an alternative product, if, for example, the original request is denied Improved oversight of the end-to-end process and more timely resolution of queries. By enabling banks to target consumer credit offerings more appropriately in the first instance, customers are much less likely to be repeatedly offered unsuitable lending products, which will further improve their disposition towards their bank. Ambit Loan Origination delivers control and audit capabilities to the bank. The system provides an effective audit trail by keeping an accurate account of who did what and when. Finacle Origination Gain superior agility and efficiencies with enterprise origination solution The recent global financial meltdown has reshaped the landscape of the lending business around the world. MANAGING EVOLVING CUSTOMER EXPECTATIONS. Chinmaya Joshi Pre Sales Manager, Retail Banking. Break through. FRONT ARENA FOR TREASURY Enhancing Profitability Driving a sound and profitable treasury requires a system that can help efficiently manage the bank s strategic, operational and risk management requirements. ASSET ARENA PROCESS MANAGEMENT Frequently Asked Questions ASSET ARENA PROCESS MANAGEMENT: FREQUENTLY ASKED QUESTIONS The asset management and asset servicing industries are facing never before seen challenges. Deloitte and Salesforce.com Bringing cloud computing to the banking industry Cover head Cover head insightful Retail banking operations are recovering from one of the biggest shocks in industry history. can you simplify your infrastructure? Accounts Payable Automation: Top 9 Reasons to Automate: The Essential Guide to Why Your Business Needs to Automate its Invoice Processing.